I’m please to say that spit roasted veal is now back on the menu card! How juicy and tasty is this looking? It’s taken me a long time to come round to the idea of cooking veal because of the poor state of animal welfare for the calves concerned but recently I was watching a TV program by celebrity chef Gordon Ramsay and it had a long running feature about rearing veal and campaigning for veal to come back onto the British menu. The presenter explained that the legislation around the production of veal has changed, the calves are able to roam freely and so the animal welfare issues surrounding the production of veal are much less. The result is what’s described as “pink veal”. Sadly, quality veal is still difficult to buy in the UK so to get the rolled joint that I’ve used for this rotisserie, I had to travel to France. (Don’t worry, it wasn’t the only reason I was in France!) Things are changing however and hopefully your butcher will now be able to help you. Learn more on the animal welfare of veal calves and why we should make a positive choice to eat veal. This veal rotisserie recipe is really simple, it’s more a matter of time, but do remember that veal is from the beef cow so it’s perfectly OK to eat it when it’s a little pink or sanguine. So from a texture perspective it’s better to be slightly under than over and dried out. The serving stats on this recipe depend on how big a piece of rolled veal you get. I work on about 250g or ½lb dry weight of meat per person. A larger rolled joint will be longer yet approximately the same thickness so the beauty of this recipe is that no matter how heavy your rolled joint is, the cooking time is exactly the same. Anyone could write this spit roasted veal recipe, right? Well veal is such a subtle flavor I prefer not to smother it in herbs and spices but to let the rotisserie cooking process add the flavor. Thread the rotisserie rod as centrally as possible through the length of the meat and secure with the forks at each end. Lift the spit rod in the air and rotate it by hand to check that the meat is balanced. 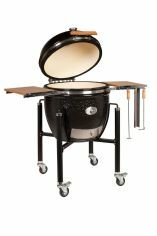 This ensures that the meat cooks evenly on all sides and doesn't excessively strain the rotisserie motor. If significantly out of balance, you can always have a second go at re-threading it. Start on a high heat to brown the fat layer on the outside and start to mobilize the fat into the drip tray. Catch the juices in the drip tray and baste the spit roast every 10 minutes. After 10 minutes, reduce the heat and cook for a further 50 minutes. Remove the veal from the grill and allow it to rest for 15 minutes. Not only does this allow the juices to settle and so keep the meat moist, it also allows time for the spit rod to cool so that you don't burn your fingers when you come to remove it. 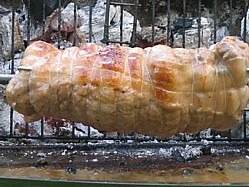 Now you might think that I’m crazy but my absolute favourite way to serve spit roasted veal is actually to let it go cold and then thickly sliced into a freshly cut bread roll with mayo – you get succulent meat with that unique barbecue flavor…….fantastic.